Good morning! Time for another Meal Prep Monday! 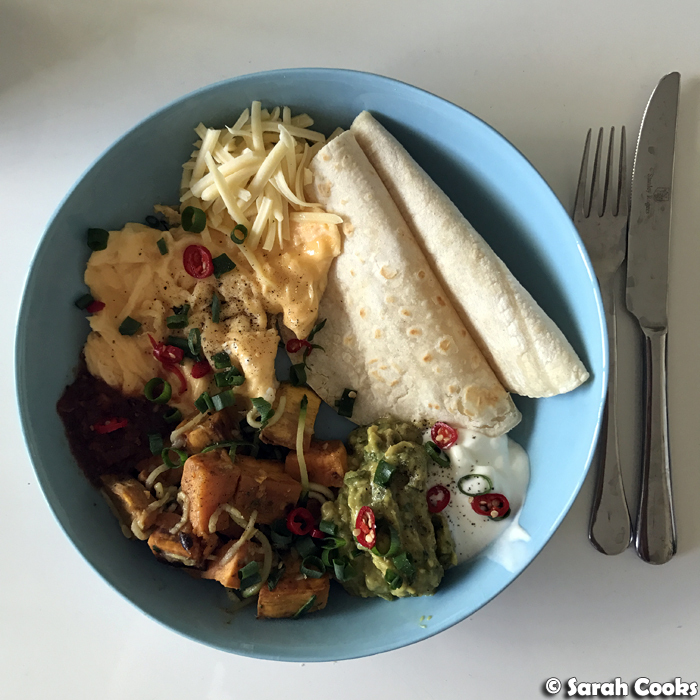 This week's offering is Mexican style! 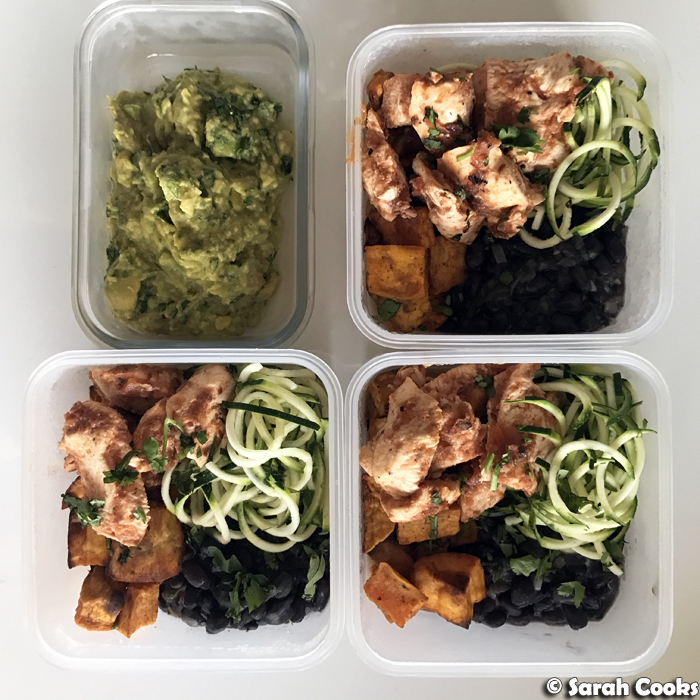 In this meal prep, we have chipotle chicken, cumin-roast sweet potatoes, frijoles negros (black beans), zucchini noodles and guacamole. 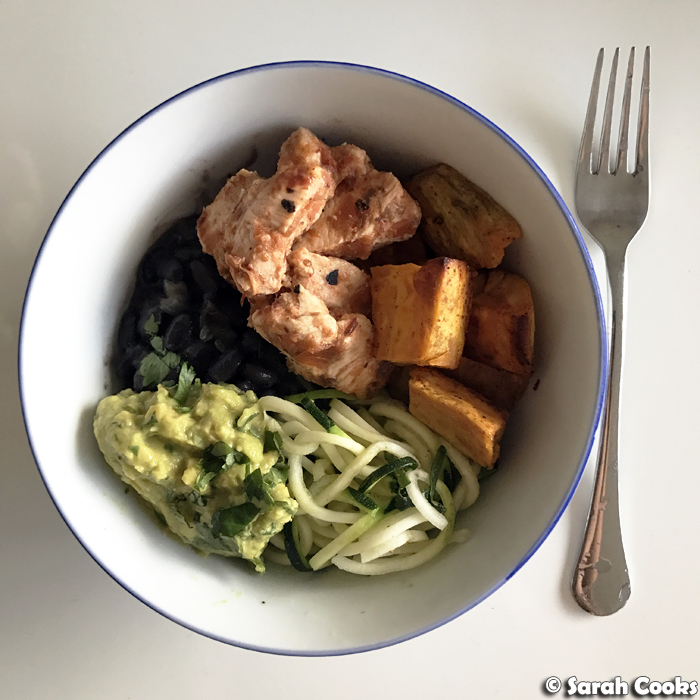 I loved the flavour combos in this one - smoky spicy chicken, earthy sweet potatoes and zingy guacamole. I hadn't made frijoles negros before, but they're such a good addition to my repertoire - full of protein and fibre, filling and delicious. I marinated the chicken in this chipotle salsa that I bought, but you could use any marinade or seasoning you like. This one is quite fabulous though, I've been putting it on everything! Here are the recipes. (Obviously, let everything cool down before packing them away). Preheat the oven to 220C. Cut 2 chicken breasts into small-ish pieces. Add 2 tablespoons chipotle salsa and stir to combine. Set aside for 30 minutes at room temperature. Place the marinated chicken pieces into an oven tray and bake for 15 minutes, or until the chicken is cooked through. Preheat the oven to 220C. Peel 1 large sweet potato and cut into 2 cm chunks. Drizzle with a little olive oil, and sprinkle with 1/2 teaspoon cumin, salt and pepper. Place into an oven tray and bake for 15 minutes, or until softened and slightly browned around the edges. Wash 1 zucchini and trim the edges. Put through a spiralizer. (Alternatively, grate the zucchini, put it through a mandolin or just julienne it finely with a sharp knife). Finely chop 1 spring onion and place in a small bowl. Add a generous pinch of salt, a grinding of black pepper and the juice of 1 lime. Mash in 1 ripe avocado. Stir through a small handful of chopped fresh coriander. I was particularly pleased with this meal prep because it left me with lots of leftovers to use. I had slightly too much cooked chicken, frijoles and guacamole for my four lunches, so I kept them in containers in the fridge and worked at them throughout the week. I also picked up a packet of corn tortillas to go with. 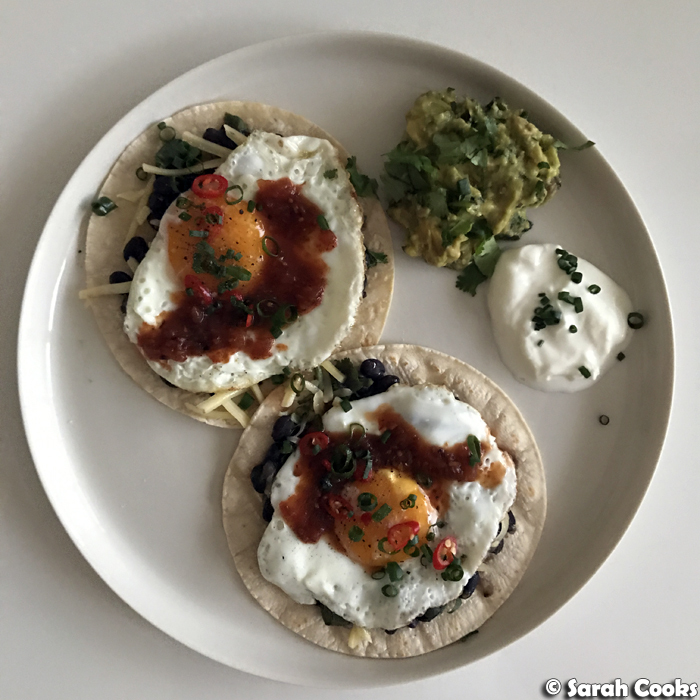 One morning I made a version of huevos rancheros - tortillas topped with frijoles, cheese, fried eggs and chipotle salsa, with guacamole and some Greek yogurt on the side. More eggs - this time scrambled, with the guacamole, the roast sweet potato and zucchini noodles, more chipotle salsa, plus cheese, corn tortillas and some Greek yogurt. 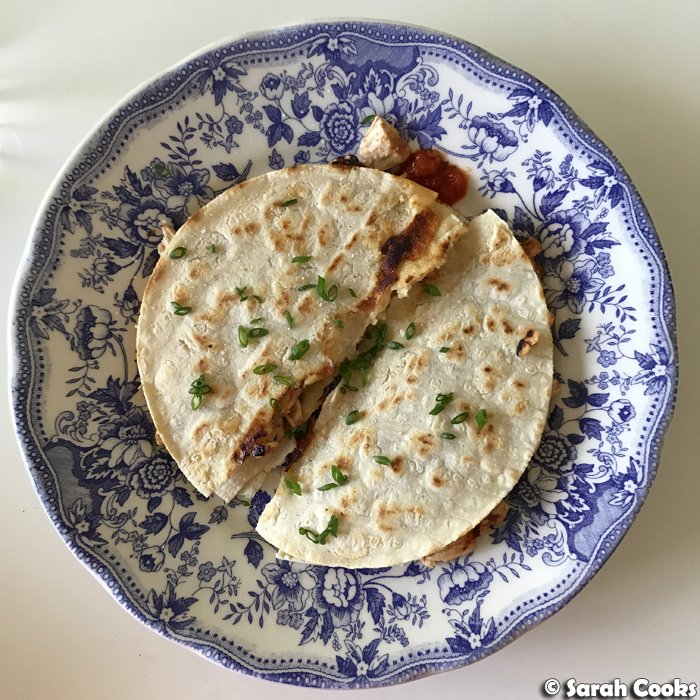 Finally, I made a simple lunch by shredding up the remaining chipotle chicken, mixing it up with some cheese, placing it between two corn tortillas and toasting it in a dry frying pan. The food looks fabulous. 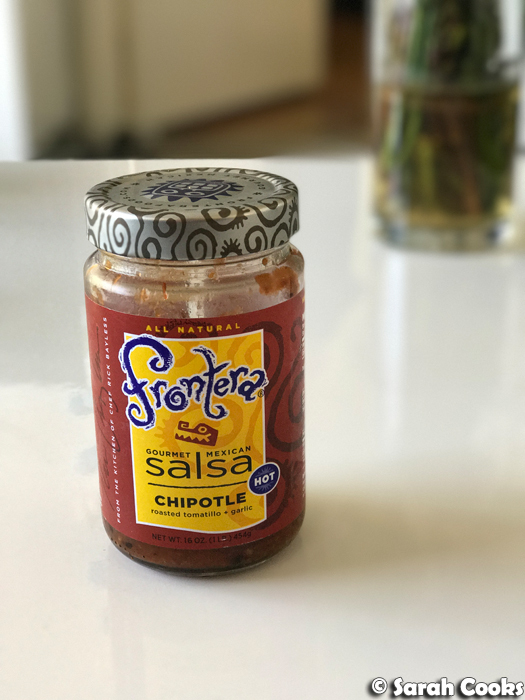 Could you please tell me where you bought the Frontera chipotle salsa from? I live in Brisbane.